No part of your vehicle is made to last forever, of course, and the air conditioning system is no different. It undergoes a lot of daily wear and tear which can eventually cause it to break down completely. Certainly, it’s smart to get an AC check if you begin to notice the air isn’t as cool as it used to be. 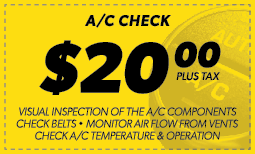 It’s also prudent to plan an AC check once a year or so, when you’re at Meineke in San Mateo CA getting other routine maintenance done.